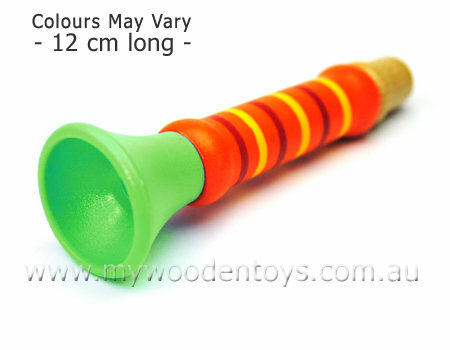 Mini Wooden Trumpet Toy is a sweet small colourful toy which makes a very satisfying duck like squeak sound when you blow it. This little wooden musical instrument is a great addition to any toy music collection and is wonderful toy to pop in a party bag. The trumpets mouth piece and body is made from wood and the end part is plastic. Material: Wood, Plastic, Child-safe paint. We like this because: "They make such a funny duck like sound."